"Where once you had the freedom to object, to think and speak as you saw fit, you now have censors and systems of surveillance coercing your conformity and soliciting your submission. How did this happen? Who's to blame? Well, certainly there are those more responsible than others, but, truth be told, if you're looking for the guilty, you need only look in a mirror. I know why you did it. I know you were afraid. Who wouldn't be? War, terror, disease. There were a myriad of problems which conspired to corrupt your reason and rob you of your common sense. Fear got the best of you, and in your panic you turned to the now-High Chancellor. He promised you order. He promised you peace. And all he demanded in return was your silent, obedient, consent." 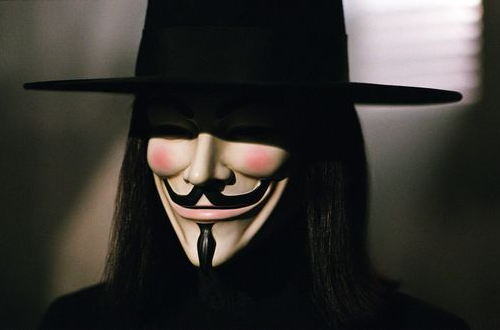 "Remember, remember, the fifth of November. The Gunpowder Treason and plot. I know of no reason why the Gunpowder Treason should ever be forgot." Nice. I was waiting for a V for Vendetta post from someone today. Glad to be the first you saw! Surprised no networks here are showing the movie. Epic movie (well, to me at least). Epic image. Love the film... in fact I feel my current government has become somewhat like in the film! Yes, and I found it fitting that it is an election day here.